Humans have a complex and adept nervous system. Our physiology is designed around specific organs dedicated to each sense, our tongue to taste, eyes to see, ears to hear, nose to smell and skin to touch. Likewise, art is traditionally regulated to just one sense. We look at art, we don’t listen to it. We listen to music, we don’t look at it. But the artists at BitterSuite, an artistic company based in London, want to change all that. Creative director Stephanie Singer believes you can taste harmony and smell tonality. Her childhood relationship with music was a unique one. When she would listen to melodies she would see images, such as birds flying. Eventually she realized seeing wasn’t the common way to experience music. Most people were experiencing music through hearing alone. The realization sparked a lifelong curiosity about the synesthetic experience. BitterSuite creates a multi-sensory experience for each audience member by creating an environment designed to cause a temporary state of synesthesia. You may have heard of people who see numbers in color. This is one example of the condition, a complex and rare neurological phenomenon involving the development of unusual cognitive and sensory pathways. Where art and science are concerned, academics and artists alike consider synesthesia a “hidden sense” capable of inspiring, or perhaps the manifestation of, the gestalt experience. Nabakov wrote about his grapheme-color synesthesia in Speak, Memory. Kandinsky was another well-known synesthete artist. Kanye once told a crowd it was the source of his genius. And perhaps the most famous example of synesthetic art is the classic Disney film Fantasia. Singer finds herself in good company, and as part of her own artistic pursuits tries to create this raw, novel experience for her audience by ensuring that all of the senses are working at one time. Music, an already well proven way to ensure bonding and community amongst humans, serves as the primary element to conjure up all of these different experiences. During the performance, attendees are given a drink and touched by a company member. At times, they are led around blindfolded, forcing them to surrender to the physical and auditory experience. In today’s tech-reliant world, it’s an unnerving experience that creates an adrenaline state within the body, biologically intensifying all of the senses. 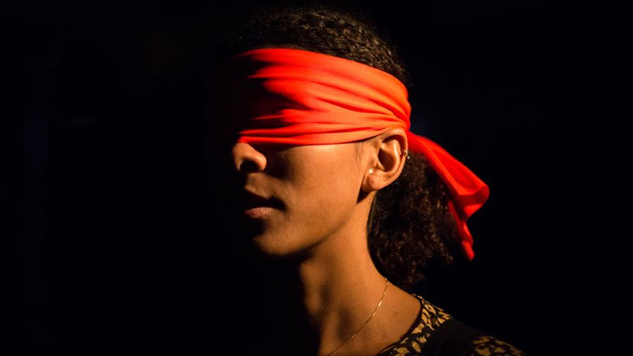 Blindfolded participants often describe the notes of music as strong, physical impulses. The environment also creates a way for those inexperienced in studying or listening classical music to understand the nuance and complexity of different masterworks. For example, as BitterSuite company members lead audience members around they also play with the sense of touch by changing their movements with the music. Audience members experience anything from tickling to squeezing and gently swaying while simultaneously having an auditory experience. You can next experience a BitterSuite performance for yourself across the pond at the Vault Festival.